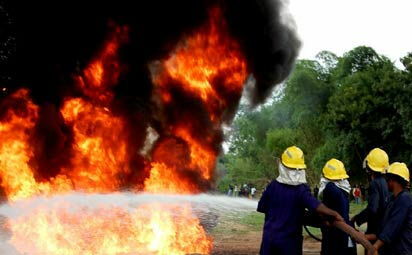 A fire outbreak occurred at Stallionaire Oil Depot on Wednesday at Ijegun Satelite Town, Ijegun, Lagos. Witnesses said the fuel depot, comprising five tank farms with one of the tanks filled with petrol, exploded and resulted in a huge inferno. Adesina Tiamiyu of the Lagos Emergency Agency, however, said prompt response by the emergency responders prevented the fire from getting out of hand. LASEMA officials, together with other emergency agencies were on ground to curtail the inferno, he said.